Death: Are we afraid of it or obsessed with it? Four panelists who deal with death in their everyday lives will explore the different ways humans wrestle with death and how our understanding of it can change the way we live now. "There are only two experiences that are absolute guarantees in life: birth and death. That just feels important to talk about," says David Balzer, Assistant Professor of Communications and Media at CMU and moderator of the event. "I'm going to risk something that may sound cliché, but perhaps reflecting on the meaning of death will give us a better sense of the meaning of living. I think it can." The public is invited to attend the discussion, titled, "Let's Talk about Death...it won't kill you." It will take place on Monday, February 11 at 7:00 PM in Marpeck Commons (2299 Grant Ave.). Admission is free and all are welcome. 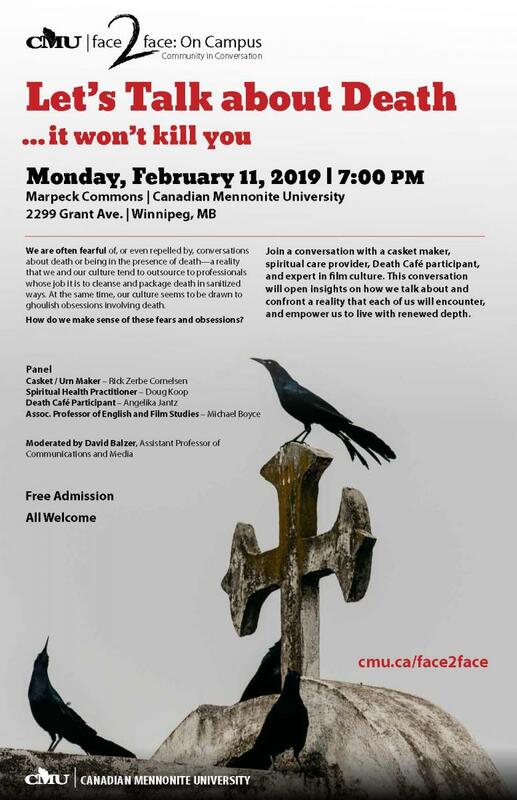 Panelists will discuss how they relate to death on a daily basis, what insights this has given them, and how a deeper understanding of death may enrich our living. They will explore both the fear people feel when faced with death but also the fascination our culture has with death. The conversation will explore more meaningful ways of understanding mortality and fostering empathy to walk with loved ones through life. Michael Boyce, Associate Professor of English and Film Studies at Booth College. David Balzer, Assistant Professor of Communications and Media at CMU, will moderate the 90-minute event, which will include opportunities for comments and questions from the audience. "Each of our panelists have been close to death... in some profound ways," says Balzer. "This is a unique resource for us. I know I haven't thought about death as much as a casket maker, for instance." Previous events have explored marijuana legalization, urban reserves, and cohabitation. "Let's Talk about Death...it won't kill you" is the third of three Face2Face events CMU is hosting during the 2018-19 school year. For details and to watch alive webcast of the discussion, visit cmu.ca/face2face.